Numark Oval Cosmetic Pads contains approximately 50 100% pure soft cotton, double-faced oval cosmetic pads in a plastic pack with draw-string tie. Specially layered to reduce surface fluffing. Ideal for applying and removing make-up. Plain, non-fleecing surface adsorbs liquid making it ideal for cleansing purposes. 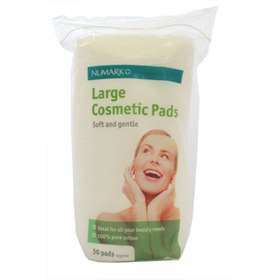 Gently textured surface retains liquid making it ideal for applying liquids and toning.